? 's Answered: How Tinder Works, How Do Tinder Matches Work & More! The dating game, from the times of Romeo and Juliet, has always been about the romantic desire to find that perfect match, that everlasting love, that significant other. It’s an innate part of human nature. Today, the way we work and communicate has been totally revolutionized by the internet. In more recent years, the way we play too has been revolutionized by the internet, and more specifically by a dating app, Tinder. Launched in 2012, unless you have been hibernating under a stone, this omnipresent, social media app is known the world over. Its use, and effect, can have a profound outcome on its users in one of the biggest decisions that people make in their lives, i.e. finding a partner. Tinder is a social media app that helps people connect with other users (through clever use of algorithms), and figures out that they may be a potential match. Back in the day (early 1990s), the idea of meeting your partner online seemed futuristic, if not a little sad. However, in today’s society smartphones have replaced bars and clubs and make meeting your potential soulmate as easy as 123 with the swipe of your finger. Singletons can mingle with potential partners from the comfort of their own home without the constraints of physical geography… no longer is it necessary to go out and meet people in bars, cafés or dance clubs. How does Tinder work in this new world of modern love? To swipe (left or right) or not to swipe, might be the modern dilemma, but how does Tinder match people and how do Tinder matches work? The truth is, no-one actually knows, except those clever tech guys whose algorithms are a closely guarded secret. The reality is that Tinder cleverly (and very quickly) produces 10-15 potential matches creating intrigue, excitement and a short adrenalin rush with users dreaming that true love might actually just be a swipe away! Before you know it you’re hooked – and if you’re very lucky, hooked up! So, for the completely uninitiated, let’s take a closer look at how Tinder works and see how you match on Tinder. First things first, you must download the Tinder app and create an account. This is done using your Facebook account (all very user friendly with easy to follow prompts from the app) which will be useful for choosing photos to introduce yourself to the Tinder population. Here is where you can give a brief description of yourself – a short, casual bio. 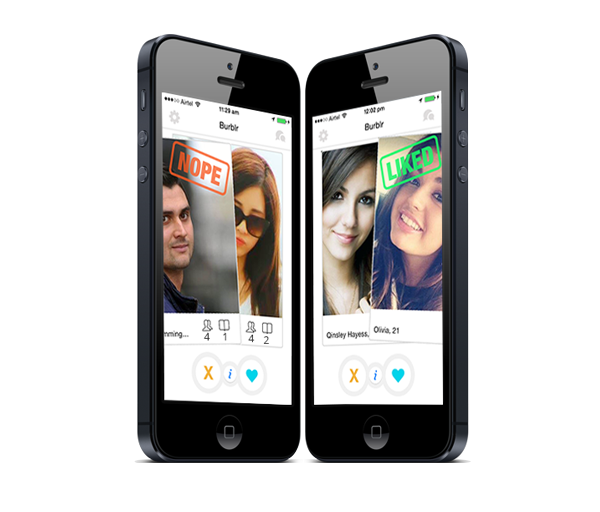 How the Tinder app works once it has been set up is through its now infamous “swipe” option. Once your account is up and running you can immediately start “meeting” other people and looking into their profiles. The profiles of the other people will be similar to yours, giving information such as name, age, how far away they live from your location and in some cases education might be given. You will also see if and how many friends you have in common (through Facebook). Users swipe the screen to the left or to the right of the profiles they see (if you swipe left on Tinder it means you do not wish to see that particular profile again and by swiping the screen to the right means you like what you see and you are giving the profile a “yes”). This is the basics of how the Tinder app works. If the person whose profile you “liked” also swipes right and gives your profile a “yes” you will see a “IT’S A MATCH” screen flashing, followed by general enthusiasm, excitement and the feeling that “happily ever after” might just get real! One reassuring feature of how Tinder works is that, even when you have been matched, your fate is in your own hands and you can still decide and choose what is best for you. You can stash away your matches (and never get in touch with those people) or you can begin communicating with your matched person and find out more information about that person. Chatting or messaging your match is easy and casual allowing you to build up a better picture of the person on the other side of the screen. It also gives you vital time to decide if you want to continue with that match and bring things to the next stage, which might include meeting up. Tinder, how it works, is a safe, modern and easy way to find new friends or your perfect match. Probably one of the best features of how Tinder works is the fact that the safety of the user is of utmost importance. Having said that however, not everyone on Tinder may be the type of person you would like to meet nor should you feel in any way obliged to take things further just because the Tinder app matched you. The block button option on Tinder gives you the possibility of eliminating profiles, which you may have been previously matched with. Don’t be afraid to use it, especially if you feel in anyway harassed or not comfortable with the behavior of another user. Safety first always! How does Tinder work now that you’ve been matched and that it has convinced you (through further chatting online) that you might take the next step? When that decision has been made Tinder has done its job (for now) and you are on the exhilarating path to meeting a new friend or maybe the love of your life. Have fun and enjoy the experience, who knows, it may just be love at first swipe! If you’re interested in knowing how to find someone on Tinder download Cheaterbuster (Formerly known as Swipebuster or Swipe Buster) today! Cheaterbuster is the best way to find answer the two burning questions – is he on Tinder? Is she on Tinder? Find out today!